Here at Arobase we firmly believe in partnerships. There’s an old saying “If you want to go quickly, go alone. If you want to go far, go together” and it’s a saying that informs nearly all of our business decisions. We started the company as co-freelancers with a firm belief that two heads were better than one. Since that day, we have established a wide network of clients through referrals and genuine personal relationships and regularly call upon the support of talented creatives and reliable suppliers to aid our operations. In our line of work, we make meaningful change to other businesses through branding and design and ultimately help them sell their products and services. With a genuine interest in helping others and wishing them success, we become emotionally invested in our clients and their businesses. We become their creative partners, or ‘brand guardians’ and their success, is our success. There is no better example for us than our lasting partnership with Hi Coffee UK. We first met Jon (Managing Director) in November 2015, after pouncing on an opportune tweet in which he was calling out for a creative team that could help grow and shape the Hi Coffee brand into a national chain. At this time Hi Coffee had two express stores: Newport and Neath Train Station. They had tested the water with designers in the past, working with both a local agency and freelance designer, but having seen their brand overhauled multiple times, something was still missing the mark. Hi Coffee weren’t just looking for a graphic designer or branding agency, they were looking for a creative partnership. A team that could take on board the essence of the brand and Jon’s entrepreneurial, creative, ideas to shape a resolved identity for Hi Coffee that would scale as their business grows. 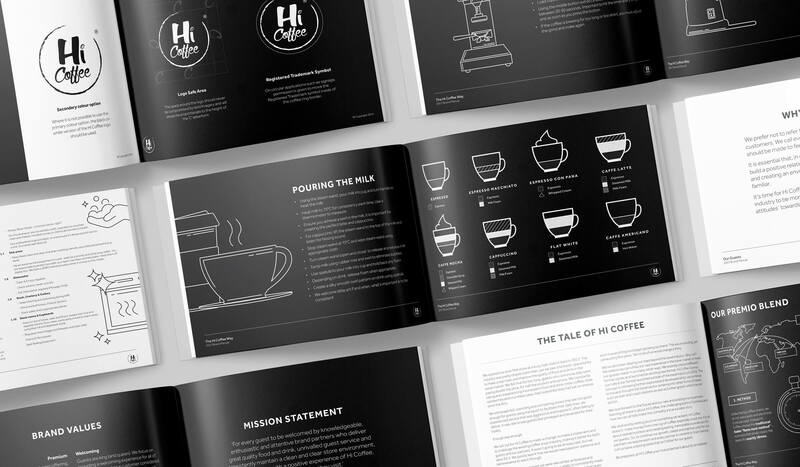 We started working with Jon later than month, assessing Hi Coffee’s brand values, communication guidelines, customer perceptions and core vision. From there we refreshed the brand identity, keeping in place the familiar Hi Coffee logo whilst streamlining the imagery and typography. After re-working packaging, menus, store signage and stationery Hi Coffee finally felt like the premium, coffee shop chain it had set out to be. Fast forward to now, we’ve been working with Hi Coffee for just over 3 years. Trying and testing store formats, constantly evolving menu systems and creating countless promotional campaigns. We’ve developed everything from their graphic design to animation work and carried their unique aesthetic through to their website and online presence. The chain has expanded nationally, adding Plymouth and Gatwick to it’s portfolio as well as trialling innovative sub brands such as Hi Coffee Pronto and Hi Coffee Quickstop to diversify the offering. 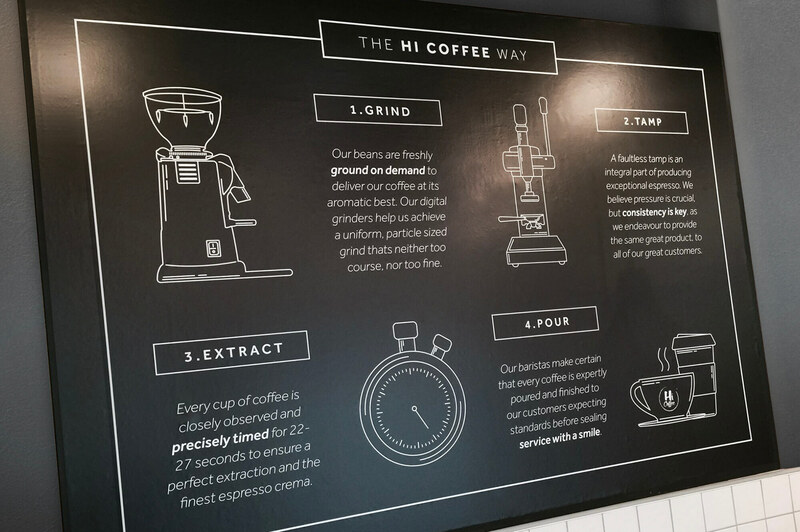 We don’t see the brand slowing down anytime soon, after really honing their market in the travel sector, Hi Coffee are expecting to launch a number of stores and franchises in the next 12 months. But one thing has always stayed the same – our partnership. All our projects feel like a collaboration between our two brands, both sides offering creative input that ultimately always improve the final result. We have regular strategy meetings and conversations that help us to not understand their goals, but for them to equally understand ours. We’re extremely positive about the future of Hi Coffee, and are looking forward to working with them as they continue to grow and innovate. If you’re looking for an agency that can truly help support and grow your brand, get in touch today for a no obligation consultation. Photography can be a powerful marketing tool and help set the tone while delivering your key messages. A picture speaks a thousand words - but consider what it is saying.